Michael Reagan tweeted a link yesterday to this transcript of his father’s second inaugural speech. It is striking how opposite Reagan’s world view was to that of Barack Hussein Obama. Perhaps after 8 years of Obama’s destructive policies, our next President will be speaking words similar to Reagan’s. 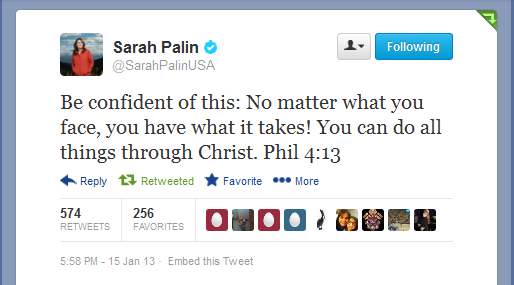 Hopefully, that President will be Sarah Palin, for whom Reagan has been a model. We must simplify our tax system, make it more fair, and bring the rates down for all who work and earn. We must think anew and move with a new boldness, so every American who seeks work can find work; so the least among us shall have an equal chance to achieve the greatest things—to be heroes who heal our sick, feed the hungry, protect peace among nations, and leave this world a better place. The time has come for a new American emancipation—a great national drive to tear down economic barriers and liberate the spirit of enterprise in the most distressed areas of our country. My friends, together we can do this, and do it we must, so help me God. From new freedom will spring new opportunities for growth, a more productive, fulfilled and united people, and a stronger America—an America that will lead the technological revolution, and also open its mind and heart and soul to the treasures of literature, music, and poetry, and the values of faith, courage, and love. We have already started returning to the people and to State and local governments responsibilities better handled by them. Now, there is a place for the Federal Government in matters of social compassion. But our fundamental goals must be to reduce dependency and upgrade the dignity of those who are infirm or disadvantaged. And here a growing economy and support from family and community offer our best chance for a society where compassion is a way of life, where the old and infirm are cared for, the young and, yes, the unborn protected, and the unfortunate looked after and made self-sufficient. Let us resolve that we the people will build an American opportunity society in which all of us—white and black, rich and poor, young and old—will go forward together arm in arm. 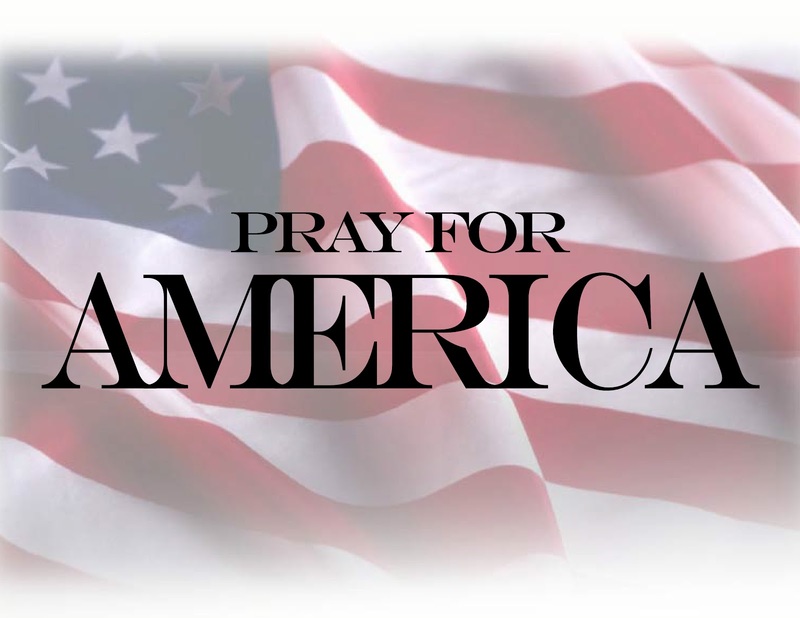 Again, let us remember that though our heritage is one of blood lines from every corner of the Earth, we are all Americans pledged to carry on this last, best hope of man on Earth. I have spoken of our domestic goals and the limitations which we should put on our National Government. Now let me turn to a task which is the primary responsibility of National Government—the safety and security of our people. Today, we utter no prayer more fervently than the ancient prayer for peace on Earth. Yet history has shown that peace will not come, nor will our freedom be preserved, by good will alone. There are those in the world who scorn our vision of human dignity and freedom. One nation, the Soviet Union, has conducted the greatest military buildup in the history of man, building arsenals of awesome offensive weapons.30 We have made progress in restoring our defense capability. But much remains to be done. There must be no wavering by us, nor any doubts by others, that America will meet her responsibilities to remain free, secure, and at peace. It is the American sound. It is hopeful, big-hearted, idealistic, daring, decent, and fair. That’s our heritage; that is our song. We sing it still. For all our problems, our differences, we are together as of old, as we raise our voices to the God who is the Author of this most tender music. And may He continue to hold us close as we fill the world with our sound—sound in unity, affection, and love—one people under God, dedicated to the dream of freedom that He has placed in the human heart, called upon now to pass that dream on to a waiting and hopeful world. Although the Left chooses to mock the mantra of “drill, baby, drill,” and they ignorantly argue against the facts pertaining to the need for America to responsibly develop her domestic supply of natural resources, surely they can’t argue the national security implications of relying on foreign countries to extract supplies that America desperately needs for industry, jobs, and security. Some of the countries we’re now reliant upon and will soon be beholden to can easily use energy and mineral supplies as a weapon against us. Of course, in this case, anyone can increase drilling and lower oil prices — as long as it is not the United States. In fact, while tightening the moratorium on the U.S. Gulf of Mexico drilling, the federal government provided money for foreign governments to use the same deep drilling techniques in South America to increase global oil supplies. The rhetorical license the Obama administration has to take all sides of this debate is an important political advantage. 1. The U.S. is on pace to become the largest producer of oil in the world by 2017 and will be an oil exporter by 2030 — according to the New York Times! 2. The U.S. has taken an overwhelming global lead on the production of natural gas. 1. With natural gas, the United States is on target to become one of the first major industrial nations to meet the CO2 goals of Kyoto — without ever becoming an official signatory. Natural gas replacement of Obama’s “all of the above” strategy has dramatically reduced CO2 emissions in the United States to 1992 levels. It is quite possible that this trend will reduce CO2 to 1990 levels — the goal of the Kyoto protocol on climate change. Currently planned power plant changes will reduce the levels below 1980 levels! 2. The abundance of natural gas has so lowered energy prices that the United States is poised to become a resurgent global manufacturing power. Energy costs are one of the most central and crucial aspects of manufacturing. The United States has lower energy costs than China and many other rival manufacturing nations, and those costs are headed lower. The unthinkable is happening: America will rise again as a manufacturing power in the course of this next mega-energy decade. 3. American energy production in oil and gas is booming the budgets of the production states into staggering surpluses! While the federal government continues sailing off every conceivable fiscal cliff imaginable, governments in states such as North Dakota and Texas are racking up billions of dollars in annual surpluses to their state treasuries. For 2012, Texas recorded an $8-billion surplus. That is expected to grow to $20 billion in 2013. The debate in the Lone Star legislature is what to do with all that extra money. Having escaped the energy “crucifixion“-fixated EPA, these states will serve as compelling counterarguments to the draconian federal vision of banning domestic production so that Middle East oil sheiks can make more money selling anti-fracking films such as Promised Land or buying TV channels from climate charlatans like Al Gore. 4. Previous norms of global oil production meant that Japan, China, Europe, and America were transferring approximately $1 trillion each year to dangerous governments in the Middle East, including Iran and Saudi Arabia. Regardless of how the global price of oil is set, the increasing prospects of that $1 trillion being transferred to the pockets of American oil and natural gas industries suggests a complete transformation of global politics. The imperative to protect Middle East oil resources with American military power is diminished. The capacity to fund petro-genocide from Sudan to Iran is severely limited. Despite the president’s insistence to the contrary, the American free market position on oil does jeopardize the global pricing scheme of oil in a way that could help every worthwhile global citizen. At present, a major portion of global supply is manipulated by a price cartel known as OPEC. The cartel is premised on the reality of controlling supply. That control is slipping away, and into the hands of nations such as Canada, the United States, and Mexico. With rational actors at the production helms, the potential for price spikes based on the irrational behavior of anti-Semitic warlords in Iran or terror-sympathetic Saudi sheiks is greatly diminished. Even though the president apparently lost this energy debate to Sarah Palin, he was clearly right about one thing: the American people are not stupid. The American people have by way of their own ingenuity and hard work built a process for extracting oil and natural gas unanticipated by advanced energy gurus such as T. BoonePickens. Pickens recently acknowledged that the abundance of natural gas means that energy alternatives such as wind are not economically viable. Predicting the future is difficult, but relying on the ingenuity and hard work of Americans has generally proven to be a safe bet — you betcha! Bristol posted this photo on her blog yesterday. Precious! 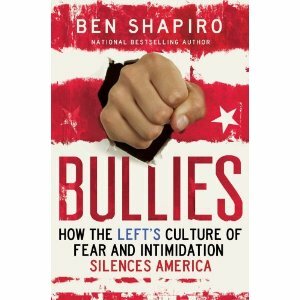 Ben Shapiro, editor-at large at Breitbart.com, talked to Kevin Scholla at SarahNet Radio about his new book, Bullies: How the Left’s Culture of Fear and Intimidation Silences Americans, which was recommended highly by Governor Palin in a recent Facebook post. In answer to Scholla’s questions, Shapiro made the following remarks (among many others). The bullies he describes in the book are the left, the media, and those in the government who demonize the other side to shut down the debate and the discussion of the issues. They are the thugs and the racists that they accuse their opponents of being. They try to shut down everything that disagrees with their positions. Thy are the bigots and the racists. They want to silence the debate. For example, they stand on the dead bodies of kids at Sandy Hook, and then they proclaim that if you disagree with them, you don’t care about the children of Sandy Hook. They have used this argument to attack the Second Amendment. 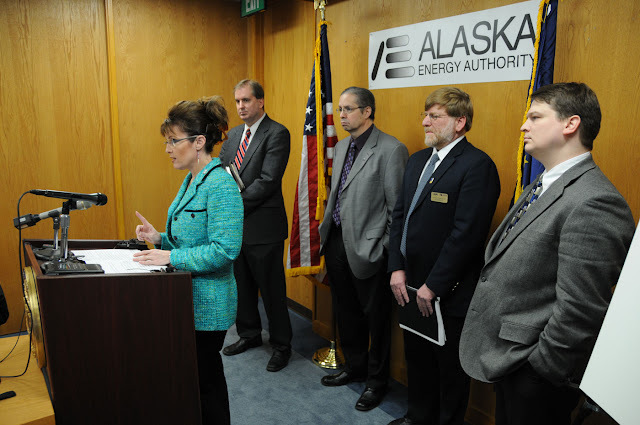 Governor Palin doesn’t buy into the narrative. She leads off by saying that people are trying to smear, so you have to take what they say with a grain of salt. It is useless to talk policy with leftists like Piers Morgan and Chris Matthews because they’re not interested in talking policy, only in demagogueing. (Read more about his interview with Piers Morgan here and watch the video here.) So you have to punch back twice as hard. Some folks out there have forfeited their rights to civility by being uncivil in the first place. The left has used race over and over again against those who oppose their positions. (Shapiro uses the Trevon Martin case as an example.) If you disagree with Obama, you’re a racist. A lot of them are just bad, nasty people. Liberalism at its root is not about evidence, it’s about feeling better than the other guy, trying to prove that they are morally right and the right is morally wrong. The left doesn’t want to have a rational conversation. To win back the party, Republicans must begin with the Tea Party. The Tea Party says, call me whatever you want. I understand you’re demagogueing the issue. The left is frightened of Gov. 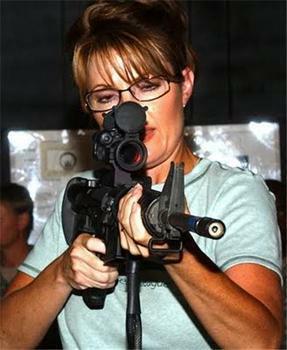 Palin because she is a woman who is a conservative. Conservatives who are members of any victimized minority group – the left hates them because it makes it very difficult to demonize them. 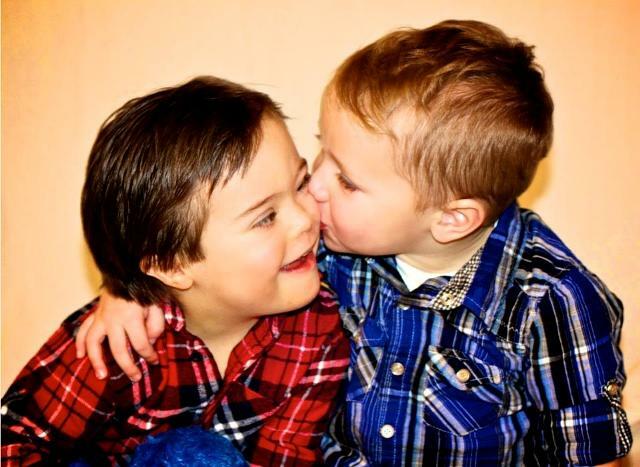 If the left does not eliminate them, they lose by default. 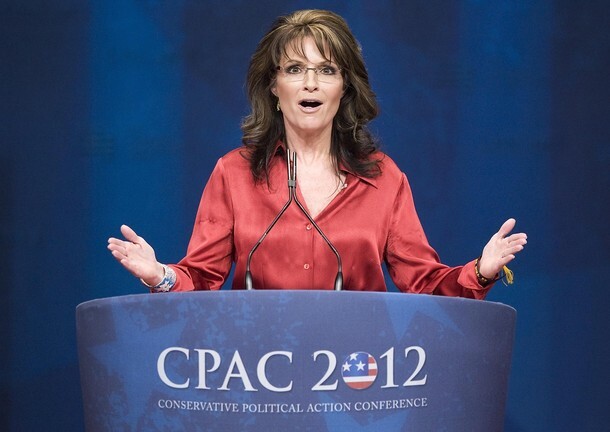 Shapiro used Sarah Palin as an example of a conservative woman and himself as an example of a conservative Jew. Shapiro said that the theme of Andrew Breitbart’s life was fighting bullies. He knew Breitbart for well over a decade, and Breitbart always said that his main goal in life was to fight the bullies. He made it his life’s message to fight against the bullies. Breitbart said that it is vitally important that we walk toward the fire and fight the fight. We didn’t start this fight, but we’re going to end it. Copies of Shapiro’s book can be purchased here and here. His new website can be found at http://benjaminshapiro.com.